As expected, AT&T has just announced that the BlackBerry Z10 will go on sale starting March 22nd for $199.99 on-contract. Pre-sales for the Z10 will begin tomorrow for those wanting to get in on the action early and the device will be available for all customers online and in stores in just under two weeks. We've yet to hear any official announcements with a release date from any of the other major US carriers, although T-Mobile business sales should go live later today. We can hope that we'll start seeing some action in the next few weeks but for now, keep reading for the full press release. DALLAS, March 11, 2013 /PRNewswire/ -- Wireless customers looking for a smartphone that helps them balance the important aspects of their lives will soon have a new option. Beginning March 12, AT&T* will kick-off consumer pre-sales of the BlackBerry® Z10 smartphone for $199.99 with a two-year agreement at https://crackberry.com/e?link=https%3A%2F%2Fwww.kqzyfj.com%2Fclick-3045577-13650413%3Fsid%3DUUcbUdUnU178398%26url%3Dhttp%253A%252F%252Fwww.att.com%252Fz10.%2526nbsp%253B&token=xxLgpB-7 The smartphone will be generally available for all customers, including corporate customers or those receiving a corporate discount, through all AT&T channels on March 22. The BlackBerry Z10 is the first smartphone to launch with the re-designed, re-engineered and re-invented BlackBerry® 10 platform, offering customers a powerful and unique new mobile experience. It is the fastest and most advanced BlackBerry smartphone yet, and is designed to continuously adapt to a customer's needs. 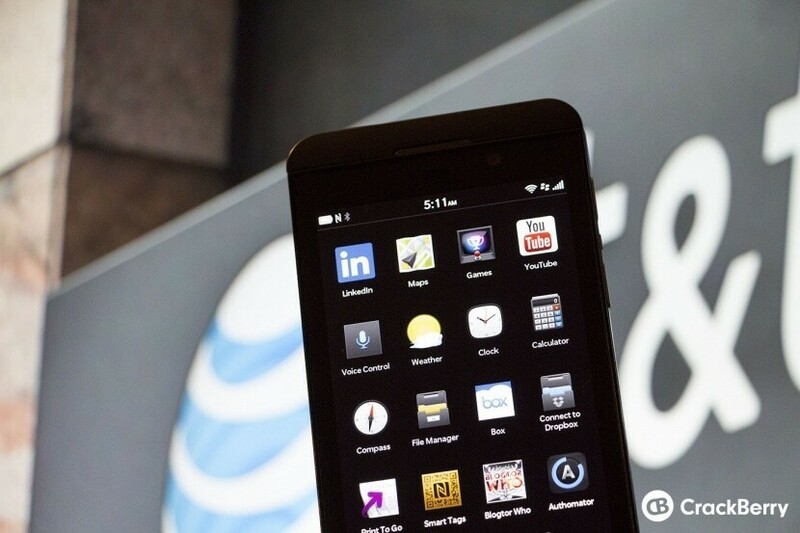 "AT&T customers were the first to experience BlackBerry smartphones and services in the U.S. and we are thrilled to bring the next evolution, the BlackBerry Z10, to the nation's fastest 4G LTE network," said Jeff Bradley , senior vice president, Devices and Developer Services, AT&T Mobility. "Customers who have grown to love the tried and true BlackBerry experience will continue to enjoy the easy typing and the secure platform they expect with a fresh platform that lets them get more out of their smartphone with easy access to all their messages in BlackBerry Hub." BlackBerry® Hub acts as a central location for your emails and conversations. You can easily peek into the Hub from any app with one swipe to see what's new, then instantly swipe back to what you were doing. AT&T is also launching the new BlackBerry® Enterprise Service (BES) 10 solution, which gives AT&T business and government customers with BlackBerry 10 smartphones secure access to work email, "behind the firewall" applications and data, and offers other security and advanced enterprise mobility management features. BES 10 provides an additional option for AT&T enterprise customers to choose from when deciding which Mobile Enterprise Management solution best serves their needs. Customers can also benefit from AT&T's extensive experience helping companies create comprehensive mobility strategies. AT&T leverages best practices and proven frameworks to address nearly every enterprise mobility challenge.